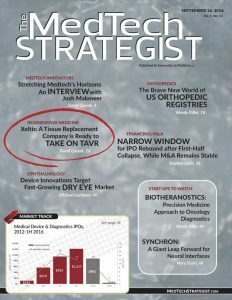 Industry discussions turn to Xeltis’ disruptive potential in heart valve replacement from the front cover of MedTech Strategist’s latest issue. In an extensive interview with Xeltis’ CEO Laurent Grandidier and COO Boris Warnack, editor David Cassak explores the opportunities for Xeltis’ technology and the potential applications of Endogenous Tissue Restoration (ETR) in cardiovascular treatment. In “Xeltis: A Tissue Replacement Company is Ready to Take on TAVR”, Cassak unveils how a company that started with tissue engineering research turned to leading the way in cutting edge technology for cardiovascular implants.